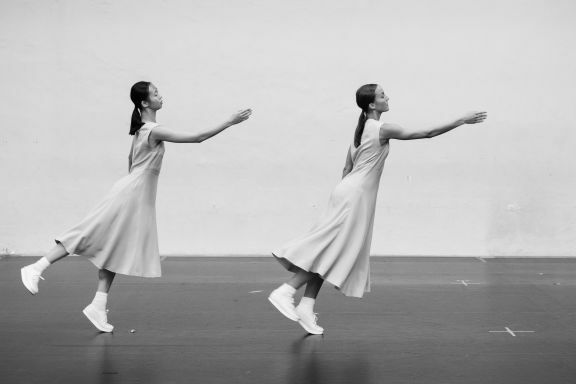 This autumn, the Festival d’Automne à Paris will be presenting a ‘Portrait Anne Teresa De Keersmaeker’ amidst a selection of ten recent and less recent Rosas productions. Among these is a retake of De Keersmaeker’s breakthrough piece Fase, Four Movements to the Music of Steve Reich from 1982, now performed, for the first time danced, by a set of two new dancers. Together with De Keersmaeker, we decided to have a look at a capital work so personally cherished by the choreographer. In 1982, Fase was the true dance debut of Anne Teresa De Keersmaeker after her more theatrical Asch from 1980. The four-piece performance was conceived when she left for the New York University Tisch School of Arts after her training at the Mudra dance school. It wasn’t only these Four Movements to the Music of Steve Reich but in fact her entire oeuvre that started with a swing of the right arm, symbolizing the incisiveness and determination De Keersmaeker has demonstrated since that debut. “When you ask children to dance, what do they do?” De Keersmaeker asks, only to answer the question herself: “Probably twist, jump, wave the arms and sway of their hips a little. In fact, those movements constitute – in a highly reduced version – the exact vocabulary of Fase: Piano Phase is made up of twisting and walking; in the second part named Come Out, two dancers are waving their hands whilst sitting on a chair, Violin Phase is spinning and the fourth part Clapping Music is jumping and swaying the hips. This allows people to recognize themselves in the choreography. After a performance, while waiting for the bus, they may try a few of these moments for a brief amount of time. It’s always nice to think of it in those terms. Ultimately, Steve Reich only came to see Fase in 1998. This was more than fifteen years after De Keersmaeker began work on the solo based on recordings of Violin Phase in New York. “I wanted to have recordings of Piano Phase and Clapping Music”, she states, “and I wrote Steve a letter. He didn’t answer at the time, but I did get in touch with Nurit Tilles and Edmund Niemann (two pianists who had formed the Double Edge ensemble and were both renowned Reich performers, Ed.). They had recorded the pieces. Incidentally, I was intensely familiar with Steve Reich’s music. I still remember the cover of Drumming, with the yellow label of Deutsche Grammophon and that black trunk with the marimba bars. Later, I also discovered Violin Phase through Thierry De Mey, and it seemed a perfect piece to compose a dance to after leaving for New York. Reich’s very first pieces like Come Out were more electronic. Then he took the step to acoustic instruments in Piano Phase. Violin Phase went a step further because it is a combination of tape and instruments, making variations on the recorded patterns. His music has a kind of horizontal fluidity to it. It is very much like a slice of eternity, but it also contains a direct invitation to dance. There is something klezmer-like about it; somebody in the village grabs a violin and people start dancing their rondo. The question was: which movements are suitable for that kind of pulse and that form of repetition? What was the process by which Reich came to organize his material, and how was one to come up with a choreographic answer to that? This led to that endless process of phase shifting, accumulation and repetitive patterning. Fase saw a reprisal for the first time in 1992 and has – with some pauses – remained on the repertoire ever since. In the meantime Michèle Anne De Mey left the company, and Tale Dolven became De Keersmaeker’s dance partner. De Keersmaeker will continue to dance Fase – especially Violin Phase – in the future, but for the first time, she is handing over full control for the four parts of this retake.